This year marks the 45th year that The Perrys have been traveling across the country, sharing The Gospel of Jesus Christ. During that time, God has proven faithful to provide everything needed to build a successful ministry. 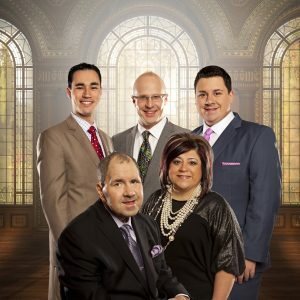 From moving lyrics of traditional songs, along with talented vocalists and musicians, to a genuine heart for people, The Perrys have proven they have what it takes to rise to the top of Southern Gospel music. Both fans and peers alike have repeatedly recognized The Perrys for their talent and hard work by honoring Libbi Perry Stuffle as Favorite Female Vocalist in 2005 and 2013, as well as Favorite Alto Singer nine out of the past ten years. The entire group was distinguished as Mixed Group of the Year three years in a row at The Singing Fan Awards. With countless other honors, awards, and radio success, it is evident that The Perrys have been blessed, not only with musical abilities, but also the gift of communicating a message and touching lives.